While living in Sicily, my diet revolved around a few main staples during the warmer months: tomatoes, basil, mozzarella, olive oil, and bread. I never grew tired of simple dishes like Insalata Caprese and Bruschetta al Pomodoro and I don’t think I ever will. Each year, as the weather warms up, I start looking forward to tomato season, knowing it will bring plates of layered tomatoes and fresh mozzarella and trays of toasted bread topped with chopped tomato to my table once again. But while the days are getting hotter, it’s not quite tomato season yet. Luckily, my Dad and my Grandpa have both planted plenty of tomatoes again this year, so we will soon have more tomatoes than we can eat. In the meantime, I decided to satisfy my bruschetta craving with another sweet red fruit that currently is in season here in the valley: strawberries. 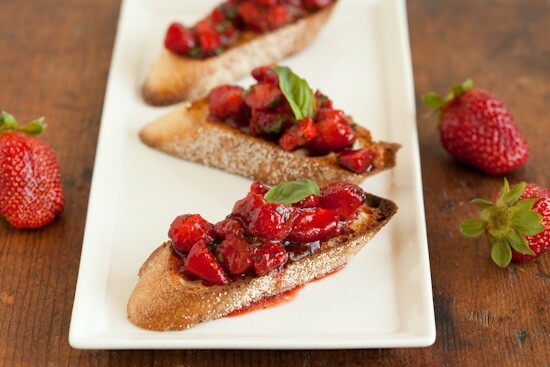 I had never made strawberry bruschetta before, but I’ve heard of people making it and I knew the flavors would work. I’ve seen some recipes that add sugar to the berries to make a sweeter topping, but that’s not what I was after. I treated the strawberries much like I treat tomatoes in the same application, tossing the fruit with vinegar, olive oil, salt, and pepper. I added some fresh chopped basil, but I think mint would be nice as well. I also threw in a pinch of crushed red pepper because I enjoy a bit of heat, but it’s entirely optional. If you have some on hand, try spreading a layer of softened goat cheese on the bread before topping with the strawberries. We found it to be a delicious variation. In a medium bowl, mix strawberries, vinegar, oil, basil, salt, pepper, and crushed red pepper. Set aside to let the berries release their juice. Arrange dry bread slices on a baking sheet and toast on both sides under a broiler (this can be done in batches). Arrange toasted bread slices on a platter. Stir the strawberry mixture then top each piece of bread with a spoonful of the berries, including a bit of the liquid with each spoonful. Garnish bruschetta with basil leaves if desired. Serve immediately. Cannot wait to give this a try this summer. Looks and sounds absolutely incredible. Yum! I would drizzle with chocolate syrup (perhaps ruining the culinary finesse of it all). I'll be trying this soon! Simple, but so very tasty and pleasant! Nicole, you're back! I love this bruschetta, the goat cheese option seem incredible. So, so tempting ... I don't love goat cheese so may try with brie or fresh mozz. I love that you made it more savory than sweet - totally up my ally! These look SO good! Thanks for posting the recipe, I love strawberries with basalmic vinegar. Once in a sushi restuarant they made us little rolls with strawberries, mint, and basalmic. So good. Yay! I was just looking at your blog the other day and thinking about how much I missed your posts! Glad to see you back! This looks stunning! Can't wait to try it! The picture makes me smile. It just says summer all over. :D I'll have to try this. The photo makes me want to run to my kitchen and make these as an after dinner "nibble"! This looks so delicious! And the color is beautiful! Thanks so much for including one of my bruschetta recipes. I love the idea of strawberries here. The strawberries at the market are perfectly sweet right now, and I know they would taste so good in this pretty bruschetta. Great springtime recipe! This is a fabulous idea!!! I will have to try it sometime!!!! Nicole, really glad to see you back! 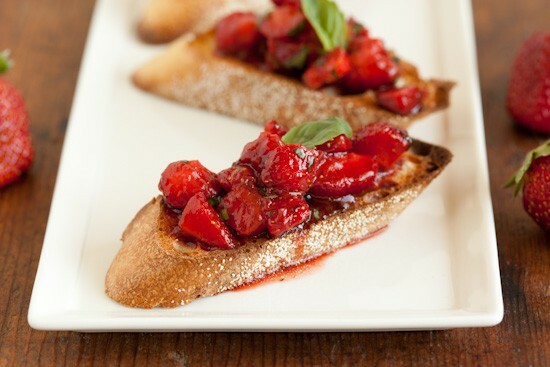 You were sorely missed!The strawberry bruschetta looks fabulous; this one is definitely going in my "try soon" list. We're having a barbecue this weekend and it would be perfect! That looks incredible! Especially for summertime! I never thought that mixing balsamic vinegar and strawberries would work, but you proved me wrong :). My wife made it over the weekeend and the whole family really enjoyed it! Looks divine - photo is making me hungry (but it is 11:30 am). Truly beautiful photographs. I recently stumbled upon and later blogged a Strawberry Balsamic Mojito. OMG was it terrific - same combination of sweet and savory. It's at http://fresnosfabulous52.blogspot.com/2012/04/balsamic-strawberry-mojito-and-easy.html. Give it a try. Very refreshing and probably terrific with your bruchetta!! YUM! I love strawberries and balsamic. That looks really CRAZY good! Can't wait to try it. Strawberry picking season opens this weekend in Sharon, MA. The color ALONE is fabulous; however, given the "season" try roasted green (or red) seedless grapes on top of goat cheese!! Delish! Always wanted to try the balsamic strawberry combo. Looks amazing. We have great strawberries in Scotland too, so there's no excuse. Looks absolutely amazing. Must make this summer and spring. Fantastic idea, never seen such bruschettas before. It really makes me hungry and I'll have to do this tomorrow. Regards. Amazing blog! Do you have any tips and hints for aspiring writers? I'm hoping to start my own website soon but I'm a little lost on everything. Would you recommend starting with a free platform like Wordpress or go for a paid option? There are so many choices out there that I'm totally overwhelmed .. Any suggestions? Thank you! It looks so appetizing. I can't wait.